Product prices and availability are accurate as of 2019-04-19 01:31:33 CDT and are subject to change. Any price and availability information displayed on http://www.amazon.com/ at the time of purchase will apply to the purchase of this product. The complete Audio Holy Bible (King James Version) The vocal talents of two of the world's most gifted artists combine in service to the most popular book of al time, resulting in The Complete Audio Holy Bible on compact disc. 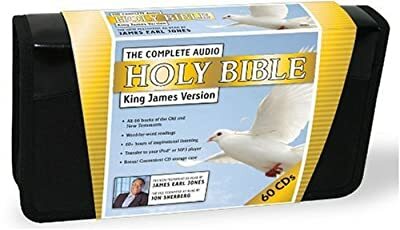 Exalt in the Word, as every syllable of the King James Old and New Testaments are brought together to life by Jon Sherberg and James Earl Jones, providing hours of inspirational listening.